Angelo Collins (center, left) and Prof. Gordon Leishman (center right), flanked by the Forum History Session chair, Prof. Bruce Charnov (left) and AHS History Committee chair, Bob Beggs. 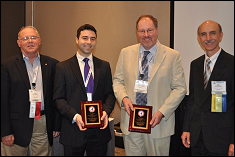 Dr. J. Gordon Leishman, Minta Martin Professor of Engineering and Alumni Angelo N. Collins won the Bernard Lindenbaum award for best historical paper at the American Helicopter Society (AHS) Forum, May 4, 2011. The paper, titled The Aeronautical Exploits of Jacob Ellehammer, chronicles the life and work of Danish born flight pioneer Jacob Ellehammer, with particular emphasis on his vertical lift machines. In 1912, Ellehammer built and successfully flew what is considered to be the first helicopter to conduct a fully controlled hover roughly 1 foot off the ground.